“你吃饭了吗？”(Have you eaten rice yet?). What this greeting really means is: “Have you eaten food yet? “ To the Chinese, rice is so important; it is synonymous with food. Not surprisingly, China is the world’s largest producer and consumer of rice. 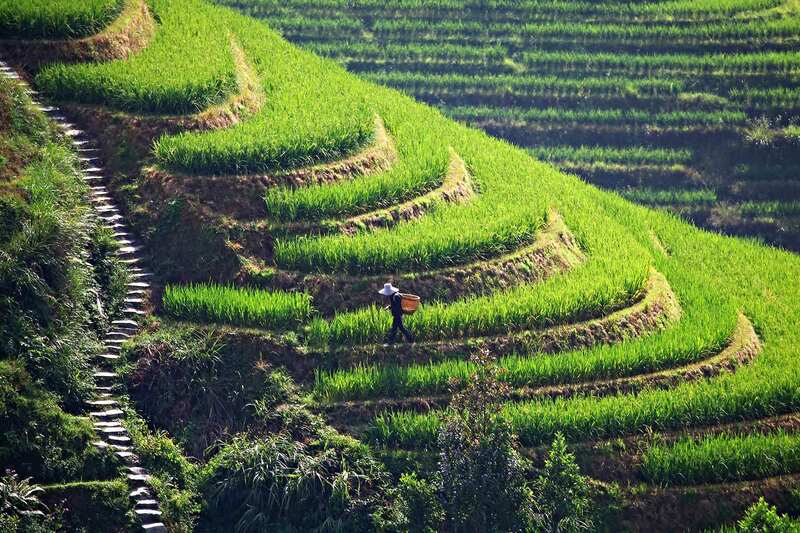 Rice is eaten all over China- North, South, East and West. Even the areas that don’t grow rice manage to get it imported. Although rice dominates Chinese cuisine, wheat products are also very important. Wheat is hardier and more adaptable, making it an obvious choice for Northern Chinese people. Of course, wheat is not confined to Northern China. People all over China enjoy steamed buns, noodles, noodles and more. In fact, Taiwan and Shanghai, both in rice- dominated Southern China, are famous for their dumpling and dim sum. While the most popular cuts are the leg and back meat, but when the Chinese eat pork, they’re taking the whole pig- head to trotter. It can be found smoked, stewed, stir-fried, red braised, stuffed into dumplings, steamed bun- the possibilities are endless. China, being so geographically diverse, is also extremely biologically diverse. In a country with so many species of edible animals, only a race of either serious vegetarians or complete idiots would ignore the abundance. Luckily, the Chinese are neither and have fully exploited their natural bounty. 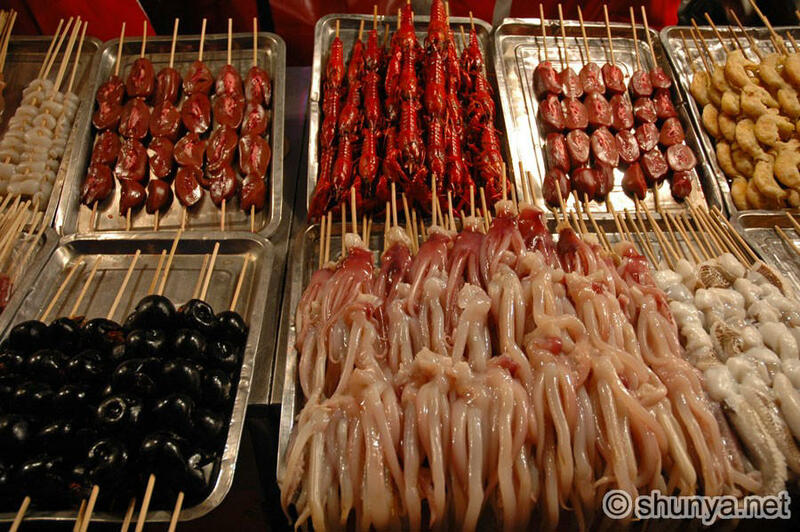 Each year, Chinese citizens eat 13 million tons of poultry and 38% of the world’s fish. However, beef is not very popular and mutton is only commonly eaten by ethinc minorities such as the people of Xinjiang and Inner Mongolia. Poultry and fish are just the beginning. Any non- toxic animal from snake to scorpion is eaten. Wait, I lied even toxic animals are delicacies. I’ve seen Chinese people willingly pay 1,000 RMB (166USD) for a sea cucumber dish and upwards 2,000 RMB for a dish of good blowfish stew. Blowfish and sea cucumber are both extremely toxic and every year, hundreds of people die from eating these delicacies. China’s amazing economic growth has allowed it population gorge itself on meat, however, this is a very recent phenomenon. For most of Chinese history, only the rich ate meat on a regular basis; the other 90+% of the population subsisted on a diet of mostly plant life. While that may sound terrible and boring, their diet was extremely varied. Walk into any Asian/Chinese supermarket and you will find yourself confronted with an endless assortment of strange greens. Think: Bok Choi, Yu Choi, Mizuna, Malabar Spinach etc. To that assortment, add melons, root vegetables and tofu products. With such a variety, who needs meat.